What are the three main concerns your airline, Ethiopian Airlines, will face within the next 24 months? Gebremariam: High and volatile oil price; It is higher in Africa by about 30% from the rest of the world. Lack of unified common Aviation Policy in Africa like that of the EU. This has resulted in African skies are more open to non-African carriers than to home carriers. What are the two or three things your airline hopes will dazzle the customers/passengers? Gebremariam: Today, Ethiopian is the fastest growing African Airline and this fast expansion in fleet and new destinations with improved connectivity in our Addis Ababa and Lome hubs along with the largest network of Star Alliance is enabling us to take our customers to any part of the world. With direct services to Seoul, Korea, to Sao Paulo and to Rio in Brazil; and Manila and Singapore also joining our network very soon, our global network is growing at an amazing speed. In most of our network today, we offer the fastest routes to customers with least total travel times. Spacious cabin which provides a spacious environment for passengers. The quietest flight experience. The 787 is 60% quitter than other airplanes. The 787 is the most environment friendly and most green airplane in the world today. It has 20% less carbon emission. Improved cabin environment which makes passengers fell like they are at 6,000 feet while flying at 35,000 feet above sea level. Our fleet modernization program is enabling us to operate the youngest fleet in the continent. Our average fleet age is only seven years old and customers prefer to fly with new airplanes. Last week, Sky Trax has given us one of the most prestigious awards in the Paris Air Show; that is the best airline staff service in Africa. While this was a very strong vote of confidence from our customers and Sky Trax, it also testifies that our service strategy excelling in service delivery is the right one and it is working well. We want to be the friendliest African airline with superior customer service delivery and the best Ethiopian hospitality. What are the focus markets for Ethiopian Airlines? Gebremariam: Our home market is always Africa, which is our special area of focus. 67 years in reliable service, we know Africa better than anyone. With the strategic location advantage of our Addis Ababa hub, we want to make a special focus in the emerging markets of Asia, Africa and South America. Off course, the matured and developed markets of Europe and North America are also important target markets for us. What is the percentage of connecting passengers flying with Ethiopian Airlines? What is the percentage of African passengers flying with Ethiopian Airlines? What is the percentage of business passengers on your flights? Gebremariam: Over 70% of our total passengers are people traveling for business with different types of businesses. How much affected you the grounding of 787? Gebremariam: The grounding of the 787 has affected us seriously in both operational, commercial and financial terms. What percentage of your revenues account cargo operations? 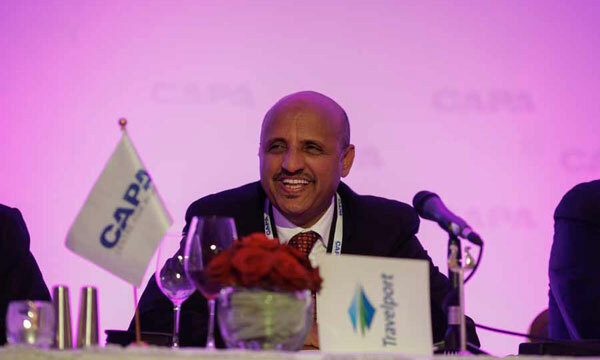 Gebremariam: Close to 18% of our total revenue comes from cargo operations; Ethiopian Airlines is the largest cargo operator in Africa with 6 dedicated freighter aircraft in addition to significant belly hold capacity. What are Ethiopian Airlines key points of success? Gebremariam: Uniquely dedicated and highly committed work force led by experienced and seasoned executive management and board of Directors. Efficient network of connectivity based in a strategically advantageous located hub which enables us to connect Africa with the rest of the world better than any one else. Investment in systems like ICT, best practice processes etc..
How important is to be part of the alliance? However recently you signed a code-share with Oman Air not member of Star. Do you plan to sign similar deals with other non-alliance carriers? We will continue to enter into similar agreements with non-Star Alliance; members if it helps us provide enhanced services to our customers; and if it doesn’t conflict our Star Alliance strategy. Is there room for LCCs in this region? If yes to you fear that will take part of your market? In Europe and the North America, the LCC’s operate from secondary and less costly and less congested airports which is huge cost advantage but similar opportunity may not be available in Africa. What next for Africa aviation? Gebremariam: Africa is now the second fastest growing region in the world. With one billion people and right demographic profile, largest concentration of globally needed natural resources and the emergence of sizable middle class and consumer society, and increased democratization and good governance and prevalence of peace, it will be a strong magnet to FDI from all over the world and particularly the emerging markets like China. Hence; today we are saying it is time for Africa. The 21 century is and African century. It will be the next and perhaps the last frontier in Globalization. Ethiopian is already connecting 45 African cities with 30 cities in the rest of the world and it is strategically positioning itself to take advantage of this huge growth and economic development in the continent and in turn it will also support the development by providing irreplaceable and critically essential air connectivity and mobility. We have a multi-hubbing strategy in Africa. Do you have any additional thoughts you’d like to share with us? Come and discover Africa and Ethiopia in particular, you will be amazed by its immense opportunities and abundant riches. If board rooms of multinational and global companies are not yet discussing on their “Africa Strategy”; they will regret soon, as they will miss the opportunity window.